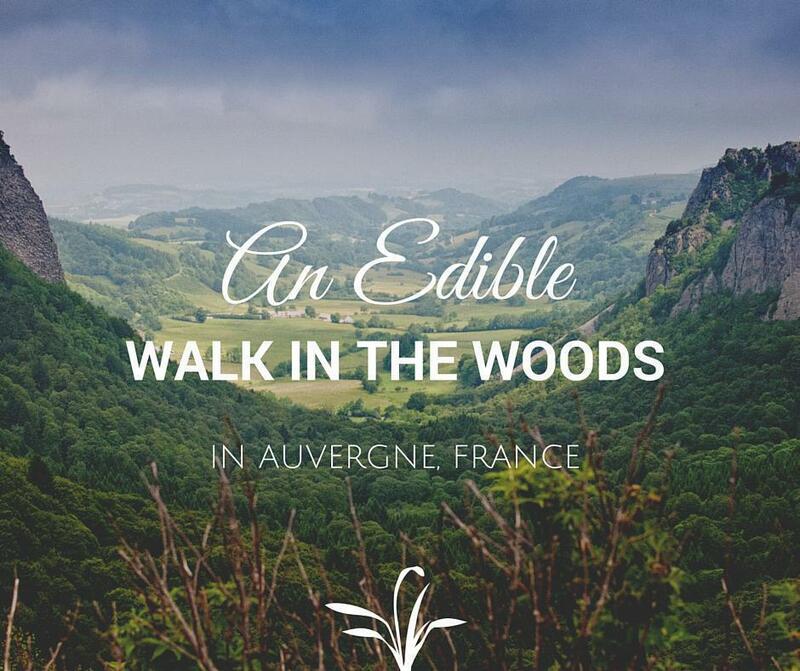 We were invited on an edible walk in Auvergne, France, with an expert forager, to discover nature’s bounty right beneath our feet. Throughout our time in France, we explored a variety of slow food and sustainable agriculture. 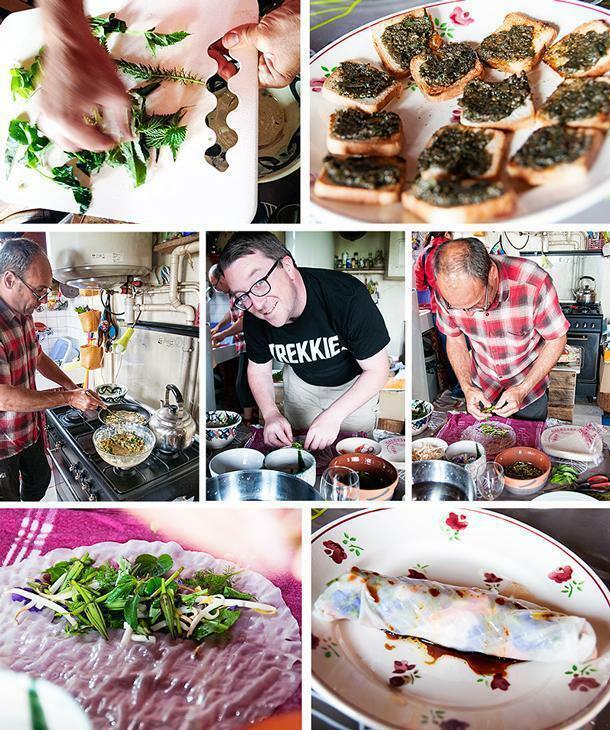 We ate high-end slow food meals and sampled local favourite restaurants. We tasted bio-organic wines and organic Cognac. And, of course, we’ve sampled plenty of organic cheese. But what could be more sustainable than gathering wild food from the forest? I’ve always been interested in the concept of foraging; of finding food in the wild and not having to pay a cent. 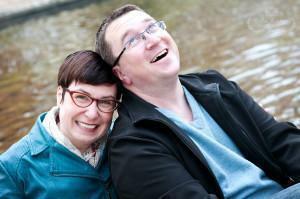 But, I’ll be honest, my concerns were twofold. One, and most importantly, I’m an utter novice and I feared gobbling down a handful of berries that were so toxic a mere taste could kill a horse. And two: I feared the food we gathered would taste, well, boring. I mean, what can you do with a handful of wild greens, other than make a salad? These concerns called for expert help. Enter Christophe Anglade, half of the duo behind Aluna Voyages, a tour company designed to bring travellers in touch with nature, both in France and abroad. Christophe is passionate about eco-tourism, world cultures, and nature. He’s travelled and worked around the globe and speaks a handful of languages. We meet Christophe at his cabin, after parking Amelia and the cats under some shady trees, and are joined by the lovely Anissa, from Auvergne Tourism. 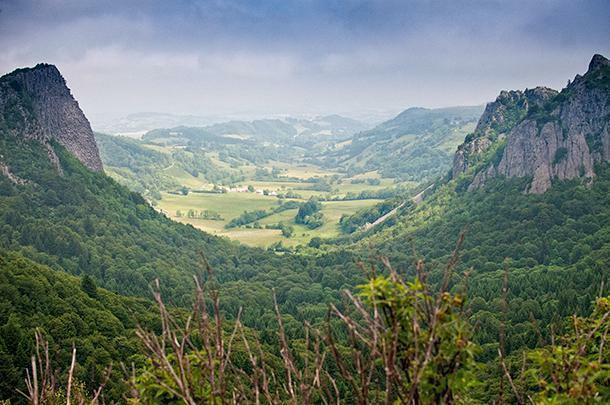 Despite his globe-trotting ways, Christophe calls the volcanic hills of Auvergne home – and with the view from his cabin, we can definitely see why. The four of us pile into Christophe’s car and we head into the forest. He has a number of spots that offer prime foraging grounds. Christophe pulls off the road and we jump out. He pulls a battered copy of a colourful book on edible plants from his pocket. It just so happens we know the author – Christophe definitely knows what he’s talking about when it comes to foraging and I feel confident he won’t let me poison myself. Even here at the roadside, there’s plenty to eat – although we won’t forage here, because of the risk of pollution from the passing cars. However, it’s easier for Christophe to show us what to look for here, in the sun, before we head deeper into the woods. There are a number of plants we recognise but had no idea are edible – clover, borage, Johnny-jump-ups; even tender tips from evergreen trees have a surprising lemony flavour. Maybe our salad won’t taste like grass after all. As we make our way into the forest, my nose detects a familiar smell – garlic. We pounce on the delicate wild garlic greens we first discovered with our chef friend in Herefordshire, England. We’ve barely walked 500m, and yet our cloth sacks are already brimming with textures and flavours gathered from nature. As Christophe expounds Auvergne’s natural bounty, even Anissa seems impressed by how much variety is available here. Not wanting to take too much from one small area, we pile into Christophe’s car again and head further down the road. At our next stop, we follow a path that will lead us over the mountain. 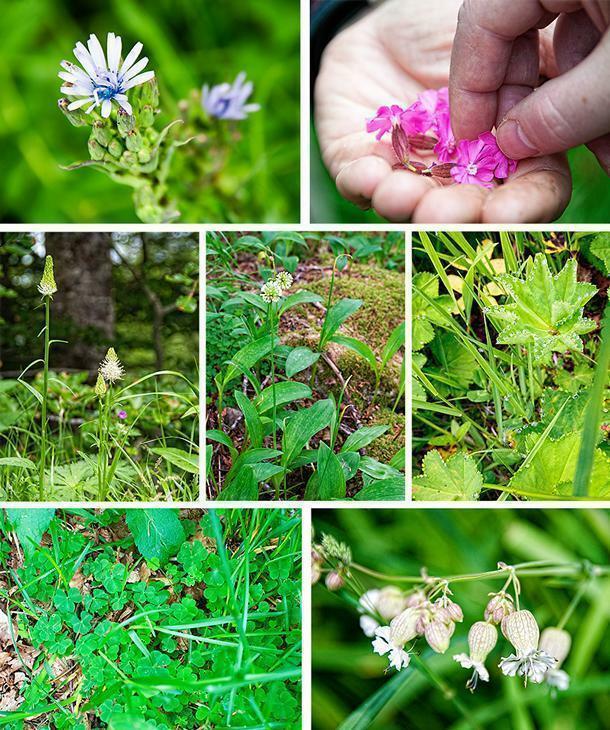 We don’t have time to do the entire walk, but the path is bordered by several edible plants. One of these plants we know well and have little desire to battle, even though we know it is tasty in the right hands – nettles. Christophe passes out gloves, but boldly shows us, bare-handed, how to pluck the tender tips without getting stung. I pull on the gloves and go to work. Christophe draws our attention to more edible plants and I’m struck by how many of the colourful wildflowers are also food sources. An edible bouquet takes on a whole new meaning. Still, I’m having trouble imagining what we will cook with our treasures. 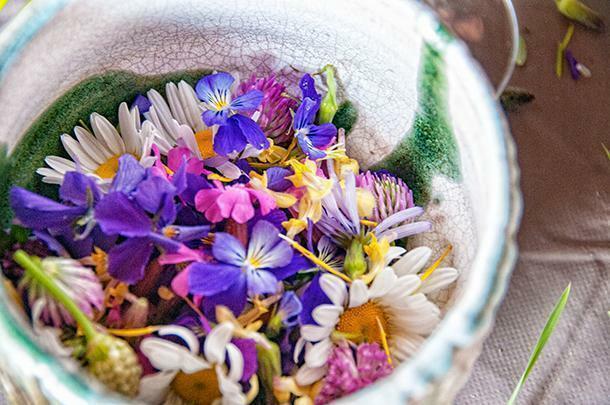 Who knew edible plants could be so beautiful? It’s time to find out. We pile back in the car for the short trip back to Christophe’s cabin. We do a quick trip around his ‘yard’ for additional supplies. Christophe’s garden is the wild meadow that surrounds his home. He doesn’t have to venture far to gather his lunch of wild plants. I adore Christophe’s tiny cabin. It’s exactly the kind of small-space living I envision for our future if our future ever doesn’t have wheels. It’s decorated with a combination of practical recycled and repurposed pieces and quirky souvenirs from his globe-trotting travels. Christophe fires up his gorgeous gas stove (which I covet, as Amelia is oven-less) and sets to work. Out of nowhere a plate of appetisers appears. The crackers (foraged from the local grocery) are spread with Christophe’s foraged pesto – tangier than its basil-based cousin. We scarf them down and roll up our sleeves to help. Right away, we discover there is no salad on our foraged menu. Instead, Christophe is whipping up a galette of buckwheat and our foraged greens and garlic, while we assemble fresh spring rolls. Our rice wrappers and bean sprouts (for extra crunch) are store-bought, but everything else comes from our foraging bags. I’ve eaten plenty of spring rolls in my time, but none have been as pretty as our flower-filled foraged rolls. The result is tastier than I ever could have predicted – crunchy, tangy, fresh. Christophe’s galette is warm and filling. 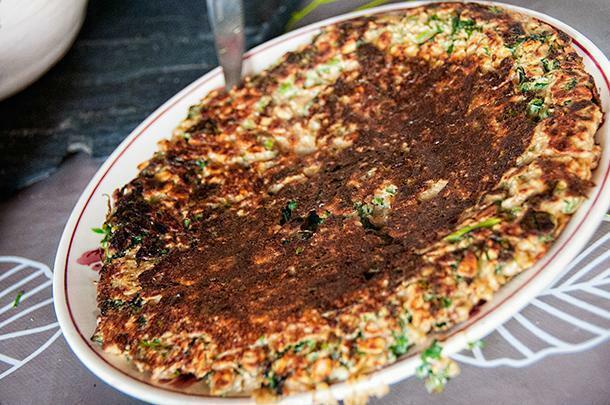 It’s a bit like a spinach and buckwheat crepe, but thicker and more satisfying. In fact, the whole meal is satisfying – the conversation and sharing of knowledge and the pride in knowing we contributed to the delicious meal. 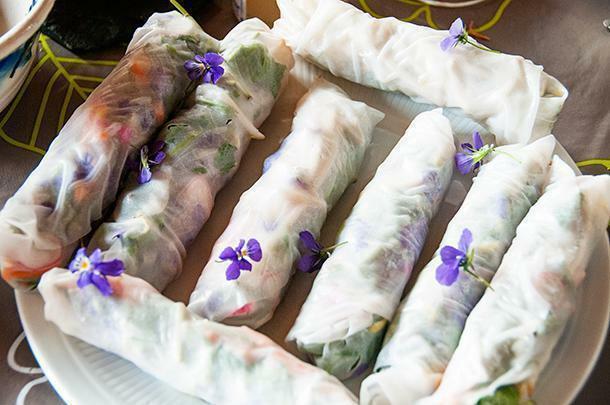 Our beautiful spring rolls are the highlight of our foraging adventure. Sadly, our time with Christophe was limited to the morning, as we need to get back to Amelia and the cats and press on. 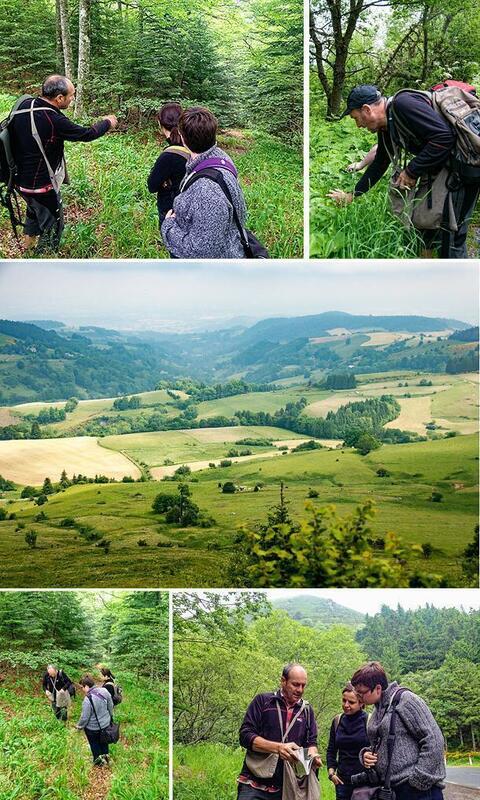 However, we wish we had more time, as Christophe offers 3 or 5-day foraging tours of Auvergne, in addition to a variety of other ways to explore the region. 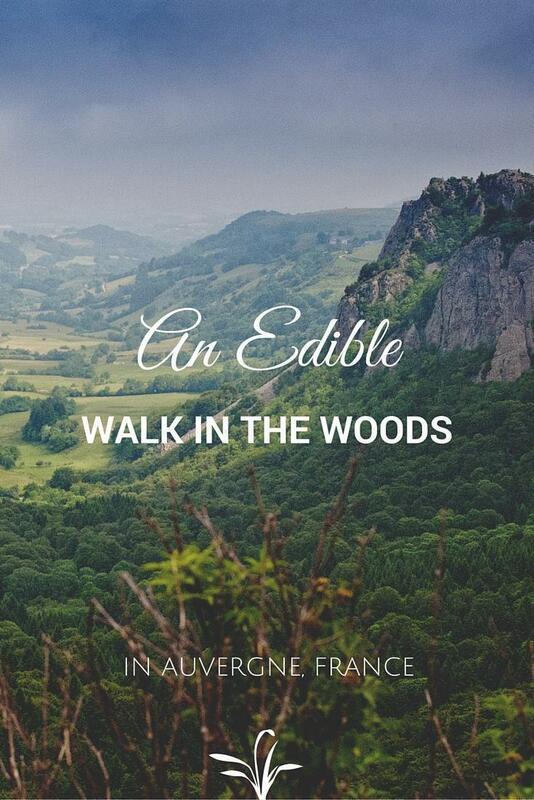 We’d like to thank Christophe for the fun and educational edible walk and the Région Auvergne Tourism office for hosting us in the area. As always, all opinions are our own.